This Jotul 602 stove installation was one of two stoves that we installed for this client. 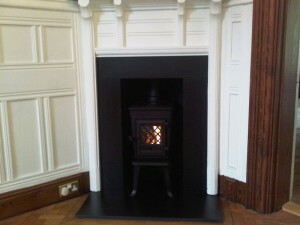 The Jotul 602 is a timeless cast iron wood burning stove. It has been a best selling wood stove for many years. 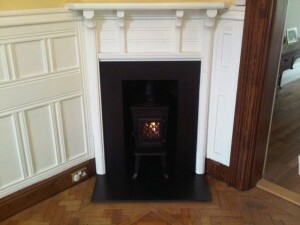 This particular stove fitted the opening of the client’s hall fireplace perfectly. It is heat efficient and is a practical wood stove with both personality and character. In addition to the stove, we fitted a new bespoke slate hearth, and some matching slate slips to hide the existing polished granite. 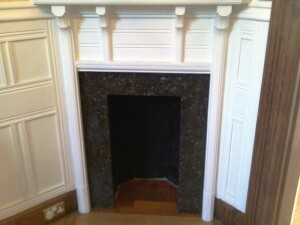 Finally, this was a great little installation for some lovely clients.